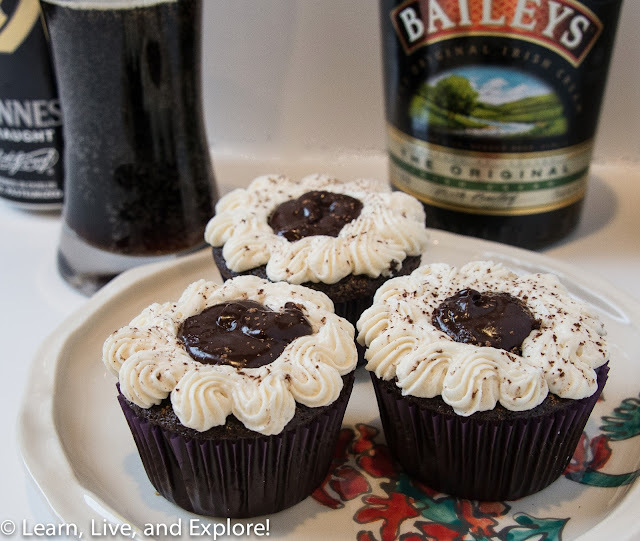 Chocolate Guinness and Irish Cream Cupcakes ~ Learn, Live, and Explore! You know the saying, March comes "in like a lion and out like a lamb?" Well, today was a giant daddy lion of a day! Fortunately, the "snoquester" storm was a bust and more like a "rainquester" because it allowed me to dip out to the local ABC store and get a bottle of Bailey's Irish Cream. Why did I need that? Because it's March! And March means it's time to love everything Irish for a month. To celebrate Irishness, I decided to make Chocolate Guinness Cupcakes with Irish Cream Ganache and Buttercream using a recipe I found on Sweet Pea's Kitchen (copied below with a few modifications). They came out great and - warning - are very rich! Hope you like dark chocolate! 1. Preheat oven to 350 degrees. Line muffin pan with paper liners. 2. In a medium saucepan over medium heat, combine Guinness and butter. Add the cocoa; whisk until smooth. Remove from heat and allow to cool slightly. 3. In a large mixing bowl, whisk together the flour, sugar, baking soda and salt; set aside. 4. In the bowl of a stand mixer fitted with the paddle attachment, beat together the eggs and sour cream until combined. 5. Add Guinness mixture and beat to combine - if mixture is still warm enough to be concerned, just to make sure, add a little at first to temper the eggs before adding the rest. Mix in dry ingredients on low speed until incorporated. 6. Fill the cupcake papers about 2/3 full, making sure that the batter is divided evenly. 7. Bake until an inserted toothpick comes out clean, about 15-17 minutes. Cool completely on wire rack. 1. Place chocolate in heatproof bowl; set aside. 2. In a medium saucepan over medium heat, heat cream until simmering. Pour over chocolate, let sit for 1 minute, then stir until smooth. 3. Add butter and Bailey's; stir until smooth and combined. Set aside until cool and thick enough to be piped. stirring occasionally. 4. Once cupcakes have cooled, use a paring knife or apple corer to cut out a small circle in the center of each cupcake. Remove the core. 5. Transfer ganache filling to a decorating bag fitted with a small round tip (about ¼ inch). Pipe the filling into each hollowed cupcake. This may be best left as the last step once the buttercream has been piped on the cupcake. 1. In the bowl of a stand mixer fitted with the paddle attachment, beat butter on medium high until light and fluffy. 2. Add powdered sugar and beat until incorporated. Add Bailey's a few tablespoons at a time until you reach your desired consistency. 4. Transfer frosting into a large decorators decorating bag fitted with a preferred tip and pipe desired pattern between the rim of the cupcake and the ganache filling. Quebec City and an Ice Hotel...brrrr!